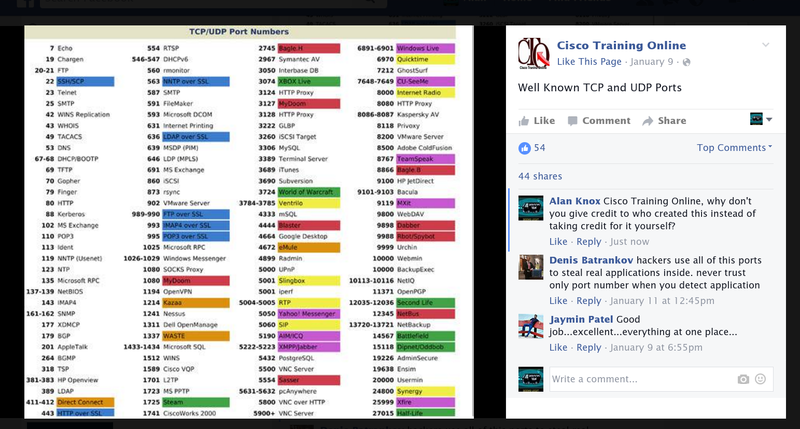 While looking over the profiles of people sending me friend requests on Facebook (if I've never said two words to you before, don't bother) I came across this page Cisco Training Online which is selling CCIE bootcamps. Just for the heck of it, I scrolled down the page. Besides the ads for their bootcamps, one image jumped out at me. It was labeled TCP/UDP Port Numbers, and it had a very familiar theme to it. Yes, it is one of PacketLife's cheat sheets, but with the copyright information conveniently chopped off. So out of curiosity, I kept scrolling down the page. Everything that was text, I put into Google. I found material copied directly from networklessons.com, material copied from a very old Cisco Press book, and material from other blogs. They're charging money I'm sure, but have they created any original content at all? Yes, I commented on the above post, and I commented on many others as well. I doubt my posts will still be there by the time you see this. 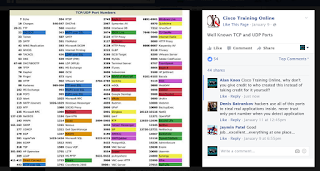 If you don't stick with the well known training companies (I think it's safe to say Narbik Kocharians and Keith Barker aren't stealing content), then be sure to investigate what you're paying for. Don't pay someone to give you material that is not theirs. And more important, don't pay someone to give you material that is freely available on the Internet. A web browser can do that for you free of charge. There is one more feature of the Cisco access servers that I do not see mentioned very often. Maybe it's been talked to death and I just missed it. But either way, I think is hugely important. That is the ability to telnet through it to the connected devices without ever actually appearing to touch the access server itself. In this post, I'll go over that briefly. To recap, in the previous post, which can be found here, I set up the 2511 on my network with an address of 192.168.10.10/24 on the Ethernet interface and 192.168.254.1/24 on Loopback0. Connected to line 1 is a 2611 router with no connection to the local network. There is a serial connection between term1 and r1, but I have not really done anything with it. or you can put a static route into your home router. I have done all three of these at one time or another, and they all work fine. This time around, I elected to put a static route into my SonicWall (counting down the days until I can replace this piece) because it is the simplest way to achieve network connectivity from my entire network. With this static route in place, I can see from the output of a ping to 192.168.254.1 on my computer, it receives a ICMP redirect from the SonicWall, and then the pings are successful. Now that the loopback on the terminal server is reachable from your PC, lets experiment and see how things work. First, I'll telnet directly into the terminal server as usual, and it still works as expected. So what happens when we telnet to the IP address of the loopback interface? Again, this is what I expected to happen. So now let's acutally use this terminal server for what it is. Let's telnet into it on a different port and see what happens. Notice how this time we essentially connected to the console port of r1. The one thing to take note of is when you hit exit, you are not returned to the command prompt of your host OS, instead, it shows console port behavior. r1 con0 is now available Press RETURN to get started. And of course, hitting enter at this point drops you back at the r1> prompt. I'm not quite sure how I feel about this behavior yet, it's going to take a little getting used to. Racked up in my lab, I have more routers, switches, firewalls and access points than I care to count. These devices are all in the basement, which is a place I don't necessarily want to set up shop when I'm labbing due do a number of reasons such as the temperature and the constant hum of the dehumidifier. So when I'm upstairs, any oopsie that causes loss of connectivity would require another trip down the stairs. So what to do? That's where my trusty Cisco 2511 comes in. This device, like many other devices in my rack, was rescued from the recycling pile at work and is becoming one of my favorite items. The only complaint that I have so far is the slow speed of the device. It's a 2500, so everything from the boot time to even just logging in is way slower than a modern router. Since I'll be using a number of these devices shortly, I'm going to set up the 2511 now. The Cisco 2509/2511/2512 router is what is known as a terminal server. This 2511 that I have has what appear to be two 68 pin SCSI connectors that are used to plug in Cisco's proprietary octal cables. These octal cables give you 8 RJ45 connectors to plug into the console ports of your other devices, making these console ports all accessible from the 2511, and therefore from anywhere that the 2511 can be reached. This would include my laptop while I sit on the couch in my living room, or anywhere else in the house that isn't the basement. The 2509 is the same as the 2511 except for the fact that it only has one 68 pin connector so it can therefore only connect to 8 devices. And then there is the 2509-RJ and 2511-RJ, which do not have the connectors for the octal cables, but instead have RJ45 jacks for use with rollover cables. Finally, there is the 2512, which is the same as a 2511 except for the fact that it has a DB9 Token Ring interface in place of the AUI Ethernet interface. If you don't want to put your faith into something as old as a 2500 series router (they were introduced in 1994 after all), there is also the NM-32A which contains 4 of these connectors and can be used in pretty much any router with an NM port. So let's get started with the 2511. I've powered up the 2511 and an additional router connected to the first port of the octal cable. The AUI Port has an Ethernet transceiver connected to it ($5 or so on eBay), and this transceiver is connected to my switch with a standard Ethernet cable. This gives me a staggering 10Mbps half-duplex connection over the network. On my octal cables, there is a yellow plastic band near the RJ45 jack with numbers from 1 - 8, indicating which one is which. Since these two octal cables that I have are the only two that I've seen, I cannot confirm whether or not this is standard. The second router, a 2611, doesn't really have any configuration on it except for setting a host name for convenience in identification when it comes time to switch back and forth between the two devices. The first thing we want to figure out is the line numbers that will be used by the connections. The command show line will give you this information. Please excuse the formatting, I'm a networking guy not a web developer. The TTY lines are what we're looking for here, and you'll see that on my router, they're conveniently numbered 1 - 16. Your mileage may vary if you're using an NM-32A and depending on which NM slot it's installed into. Note that in the column "Uses" you'll see a 1 for the first TTY line rather than a 0 as every other line has. The first TTY line is the one connected to my 2611 router. Next I'll put a basic configuration on the device. I want it accessable on the network, and easily distinguished from the other router. And since this is my lab and not a production network, I'm looking for convenience rather than security here. Don't forget to set an enable password, otherwise it'll squawk that no password is set when you type enable. The IOS I have installed doesn't support SSH at all, so that will need to be addressed at some point. Next, let's configure the the lines for reverse telnet. Cisco says "Reverse Telnet allows you to establish a Telnet connection out on the same device you telnet from, but on a different interface. For more information on Reverse Telnet refer to Managing Telnet Sessions. We'll need a loopback interface with a usable IP address for reverse telnet purposes, and then we'll set up our devices. Starting with port 2001, the port numbers indicate which line that device is connected to. Where you see r1, r2, etc. are just the names I'll be using for these devices, name them as you wish though I highly suggest the names here match the hostnames of the devices. And finally, the IP address of the loopback. Now that this is all set up, we can attempt to connect to r1. Simply type in the host name you've assigned to the device and it should connect momentarily. Note the prompt showing that we are indeed connected to r1. At any time, you can press the escape sequence of Ctrl + Shift + 6 and then X in order to return back to the terminal server. Once back at the terminal server, you can use the command show sessions to see the open sessions. You can type 1 to return to the open session for r1, or you can type clear line 1 or disconnect session 1 in order to close the session. Also note that besides the otcal cables, the 25xx access server is otherwise a functional 2500 series router, running up to IOS 12.3. The 2511 and 2512 have 2 syncronous serial ports, and the 2509 has one. They support all the same routing protocols and features as any other 2500 series router, so they can pull double duty as a backbone router in your topology. A lot of rack rentals do exactly this. So all in all, a rather useful device. Should I exceed the 16 devices that I can manage through the 2511 (which I'm sure that I will eventually), I also have a couple Digi PortServer II 16-port terminal servers which I'll probably do a post on in the future. This evening I was tasked with installing a PAK on an ASA 5512-X for a client. Sales forwarded me the eDelivery Order Notification without event, I grabbed the serial number from the output of the "show version" command, and with a click on "Register Claim Certificates (PAKs)" within the email. I already had this handy guide from one of my favorite blogs loaded up in my browser and figured I would be done in no time. So where does the woe come in? On the Cisco licensing page. After clicking the link and then logging into the Cisco site, I was brought to the licensing page. I selected the only outstanding item showing (the recently purchased license upgrade for the 5512-X), and clicked Proceed. On the next page, it asked for the serial number of the unit. As I had that handy already, I copied it and pasted it into the box. Proceed remained grayed out. After rereading the email, the output of show version and Pete's guide a couple more times, I was starting to think maybe the client would have to log in and enter everything into the licensing page under their account. So I tried one more thing before throwing in the towel for the night. After clicking towards the end of the serial number box to ensure there were no stray spaces at the end, I hit enter for no particular reason. And wouldn't you know, the Proceed button became available, and after one more page, Cisco emailed me the new PAK which the firewall took with no problem. I still can't complain as the entire process took me about 20 minutes, although well over half of it was spent wondering why the Proceed button was still grayed out. Moral of the story: if you want me to press enter after I'm done entering something into the box, say so.